In 2014, Google first announced that its Google Maps application passed one billion monthly users. Judging by this fact, it easy to see that a large number of people believe that getting from point A to point B often requires direction and planning. This same thought process is also true for manufacturers of dry bulk materials in routing those materials from point A to point B within their plant. 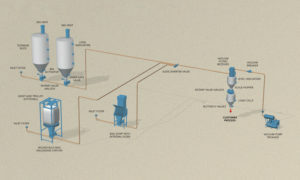 This guidance can be provided along those paths without an annoying “recalculating route” interruption telling you to “take the next available U-turn.” In order to do this, professionals examine a number of factors in determining which type of conveying system will best serve to guide materials along the way. When designing a new material conveying system, these factors are equally important, and how they are answered are interdependent on the size and type of system needed to be designed for transport. If you are going by yourself down the block to a park, you may walk. If the same park is two miles away, you may want to take a bike. Taking the kids to a baseball game across town? Then loading up the minivan is a better option. Need to make a cross country trip from New York to L.A. for a meeting tomorrow? Then an airplane is probably a better choice. Rate also needs to be defined closely. In terms of our travel scenarios, if you are in St Louis on Wednesday and need to get to Orlando by Friday, you may have plenty of time to drive there and see sights along the way. However if you have a meeting in the office at 8 AM Friday morning, you may need to hop a flight on Friday afternoon to make it. In the same thought, some plants may produce 24,000 pounds of material a day. But whether that material is produced in 24 hours (1,000 pounds an hour), or in 8 hours (3,000 pounds an hour) makes a big difference in rate required for proper system design. In another example, a plant may use 100 pounds of material in a mixture that it makes once an hour, but does that material need to be fed in one hour (100 pounds/hour rate) or one minute (6,000 pounds/hour rate)? Finally the transport itself can be important based on how many people are going. A couple can easily enjoy a road trip in a two seat convertible, but if you are taking two kids and Aunt Edna with you from Chicago to Wally World, you may need a sporty new station wagon. In terms of a conveying system, the size of a conveyor for moving 3,000 pounds an hour, over 100 feet, of 100 pound per cubic foot cement may be very different than the size of a conveyor moving 3,000 pounds an hour, over 100 feet, of 6 pound per cubic foot fume silica. This is another way of saying you can haul a lot more pounds of bricks than feathers in the same wheel barrow. It always works (Or at least, if it stops working, you probably will have more pressing issues than your material handling system). The problematic part of gravity is that it is not always practical. 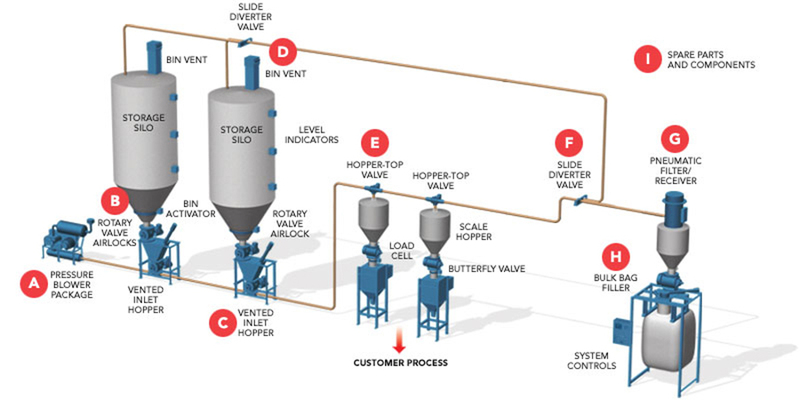 Issues like limitations in ceiling heights, costs of large structures and access platforms and raw material access can make the best process diagrams impossible to implement in pure gravity flow alone. When this happens, you probably need to flatten out your stack-up and put in a conveyor. But which conveying method should you choose? Conveying of dry bulk materials can largely be broken into two categories: Mechanical and Pneumatic. The reason for most of these limiting parameters is not engineering design or capability, but rather efficiencies and costs. In other words, it’s not what is possible to do, but what is practical to do from an efficiency standpoint. 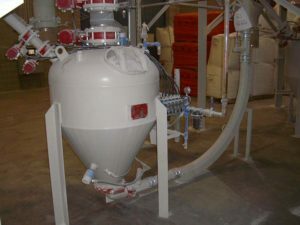 Systems that are extremely short or low rate are usually not cost effective to purchase because the fixed cost of buying a filter and a blower versus the variable cost of the pipe distance, makes pneumatic systems with pulse-jet filters, positive displacement blowers and rotary valves inefficient by comparison to a simple screw conveyor or bucket elevator. (Industry note: This does not necessarily apply to small venturi based vacuum sequencing systems sold by some manufacturers). Systems that are very long or high rate are usually not cost effective to operate because of the relatively high energy consumption required to operate the air generation devices (positive displacement blowers or compressors) as compared to the horsepower requirements of a belt conveyor carrying (for example) 100 tons per hour of coal over 2,000 feet. While a pneumatic system often may be cleaner, more self-contained and require less maintenance, the sheer costs of running a 500 or so horsepower blower that may be required to make this large of a system work, tends to make the operating costs impractical. In between these high and low parameters, pneumatic systems have a “sweet spot” though. They are often very cost competitive for these rates and distances and offer a number of advantages in terms of flexibility, cleanliness and low maintenance. This is especially true in routing. Many mechanical types of conveyors such as belts, buckets, vibratory conveyors and rigid screw conveyors do not offer a change in direction. At best, they may be run on an incline or decline, but turning requires a change to another conveyor or device. Other mechanical devices may offer some relief, such as flexible screws, Z-type bucket elevators and aeromechanical or tubular drag conveyors. These devices may offer one to two changes of direction, but that is usually the maximum. Pneumatic systems can change direction with just an addition of an elbow, to which a single system may have as many as twelve turns, as long as they are taken into account in the original sizing design. When conveying dry bulk materials pneumatically, the system designer has to also decide if the system is going to be a pressure system or a vacuum system. There are valid reasons to do each. Pressure systems are often more efficient, offering higher possible absolute pressure limits than vacuum systems in a given line size with a given type of air moving device. Another way of thinking of this is your car can often drive going forward better than it can in reverse. It’s still the same car either way, but design parameters of how you operate it allow it to operate more efficiently in one mode than another. That being said, there are often times you need to go the other way for differing reasons. The positive displacement blower is the “engine” of most dilute phase pneumatic systems. These units can operate in either positive pressure or negative pressure mode. However due to reasons of slip and air rarefication, the same blower size may do +14 PSIG, but only -7 PSIG (approximately -14” Hg). Since pressure is “force” or “work” in a line size, a pressure system can do more in a given line than a vacuum system. In addition there are some material storage devices that cannot be pressurized, like hopper bottom railcars, or can require additional design considerations due to air leakage issues, such as powdered material discharging from a lined bulk bag. The circumstances of these devices often make a vacuum system more attractive than a pressure system may otherwise be. These challenges do have design options that can be instituted to allow a pressure system to still function if needed, but may come with additional costs or restrictions. 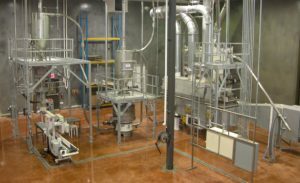 A third major consideration in pneumatic conveying is the choice of whether to design for a dilute phase system or a dense phase system. 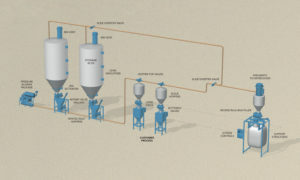 Pneumatic conveying is about moving dry bulk materials with air. You can move a lot of things with air velocity and power, a tornado is proof of that. The question is what kind of shape is the material in that was moved, after it is done conveying? Dilute phase conveying is about suspending materials in an airstream and moving them from point A to point B relatively quickly. Because there is less product friction with the pipe and you want the product to be suspended in the airstream, the velocities are high and the pressures needed to counteract friction are low. Dense phase systems move the product relatively slowly and slide the product through the pipe, often in slugs or waves. This requires lower velocities and higher pressures. 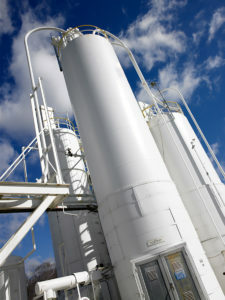 Industry estimates show that most pneumatic conveying systems (80% vs 20%) are dilute phase instead of dense phase because they are more cost effective to purchase and to operate. Most use positive displacement blowers instead of compressors for generation of the air flow. Most dilute phase systems also use rotary valves to control the material to air ratios instead of pressure vessels. The difference in prices of these items is usually significant. However dilute phase systems can be less desirable in one of two situations: When materials are friable (breakable; particle size degradable) or when they are highly abrasive. Because dilute phase systems operate at high velocities and transport material quickly, friable products can tend to be more easily damaged in their transport. If you are making a product into a pellet, flake or shape, and want the product to hold this form, banging it against the pipe (especially the elbows in a turn) can be problematic. Moving these products more slowly by sliding them along the pipe greatly reduces the opportunity for damage. Extruded shapes like pet food and breakfast cereal maintain their desired shapes for packaging and don’t wind up with less product as dust in the bottom of the bag. In addition, the slow velocities of dense phase conveying offer advantages to abrasive materials as well. Dilute phase conveying sand, for instance, is essentially sand blasting the interior of your equipment from the inside out. While dilute phase conveying of materials like cement and silica may be possible to do, equipment will tend to last much longer and be less susceptible to impact wear when being more slowly conveyed in dense phase mode. Designing a conveying system can be a very nuanced endeavor. Factors influencing design include rate, distance, volume, types of equipment or processes feeding the system or that it is discharging into and desirable properties of the materials being conveyed. The more information gathered about these factors allow for a more complete and accurate recommendation in system design. Having a good idea of where you are going and how and when you want to get there can help you more readily map out a path to a successful system.